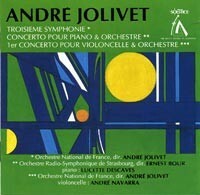 André JOLIVET: Symphony No. 3 (1964)1; Piano Concerto (1949-50)2; Cello Concerto No. 1 (1962)3. Lucette Descaves2 (pno), André Navarra3 (vlc), Orchestre National de France1,3, André Jolivet1,3 (cond. ), Orchestre Radio-Symphonique de Strasbourg2, Ernest Bour2 (cond.). Solstice SOCD 81 (1 CD) (http://www.solstice-music.com/). 1960s performances capture Jolivet’s vigorous “primitif-chic.” Why has the Varèsian-Mexican Third fallen away? Absent a revival, a big YES. 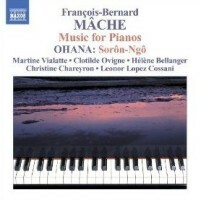 “Music for Pianos.” François-Bernard MÂCHE: Styx (1984)1; Areg (1977)2; Mesarthim (1987)3; Léthé (1985)4; Nocturne (1981)5. Maurice OHANA: Sorôn-Ngô (1969)6. Martine Vialatte1,2,3,4,5,6, Clotilde Ovigne1,4, Hélène Bellanger2,4, Christine Chareyron1, Leonor Lopez Cossani1,3,4,6 (pno). Naxos 8.557988 (1 CD) (http://www.naxos.com/). How did I miss these grand, spectral, sometimes minimal, multi-hand, two-piano works from Mâche? Ohana offers a mid-century travelogue. YES. 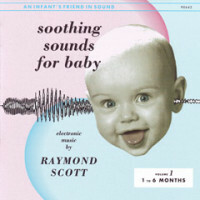 Raymond SCOTT: Soothing Sounds for Baby: Volume 1, 0 to 6 months (1963). BASTA 30-9064-2 (1 CD) (http://www.bastamusic.com/). The first of three enduring volumes of sparkling, hypnotic, ambient electronic magic. Slightly perverse, altho completely unique. YES, baby. 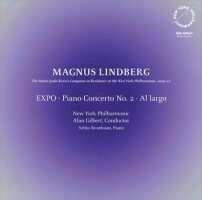 Magnus LINDBERG: EXPO (2009); Piano Concerto No. 2 (2011-12)*; Al largo (2009-10). Yefim Bronfman* (pno), New York Philharmonic, Alan Gilbert (cond.). Dacapo 8.226067 (1 CD) (http://www.dacapo-records.dk/en/). Despite powerful brass blasts, these alternately smooth then rusticated pieces do not captivate. Bronfman finds thunder in the Concerto. NO. George ONSLOW: String Quartet No. 28, Op. 54 (1834); String Quartet No. 29, Op. 55 (1834); String Quartet No. 30, Op. 56 (1834). 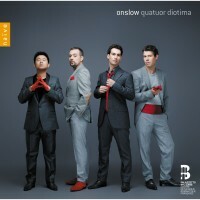 Quatuor Diotima: Yun-Peng Zhao, Naaman Sluchin (vln), Franck Chevalier (vla), Pierre Morlet (vlc). Naïve V 5200 (1 CD) (http://www.naive.fr/). A foursome named for Nono’s quartet explores a forgotten French master. Onslow had been knocked down then inspired by LvB’s late work. YES. “Extendo.” Ludovico EINAUDI: Due Tramonti (1999)1. Gaetano GIANI-LUPORINI: Ludo (1998)2. Dimitri NICOLAU: Strassenmusik No. 12, Op. 157 (1998)3. Carlo BOCCADORO: Foglio d’Autunno (1999)4. Giancarlo CARDINI: Lamento per il Mio Fiore Perduto (1998)5. Mauro CASTELLANO: Intermezzi (1994)6. Alessandro SOLBIATI: Am Fuß Des Gebirgs II (1999)7. Sylvano BUSSOTTI: Solo from La Passion Selon Sade (1966)8. 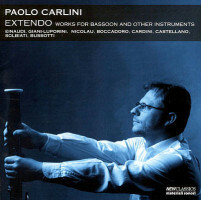 Paolo Carlini1,2,3,4,5,6,7,8 (bsn), Donato De Sena2,4 (trpt), Francesco Dilaghi2 (hpsi), Mario Marzi3,7 (sax), Raffaello Majoni4 (cbs), Ludovico Einaudi1, Folco Vichi4, Giancarlo Cardini5, Mauro Castellano6,7,8 (pno). Materiali Sonori MASO CD 90118 (1 CD) (http://www.matson.it/). Even with help from other instruments and some of the composers, this potentially exciting program promises much but fails to lift off. NO.